The concert and reception afterwards in the swank Chase Room was well worth attending. The reception deserves special mention since it was an LGBT-themed event. 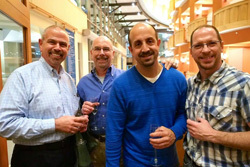 Prosecco, wine, and other refreshments were available and a selection of beautiful, bite-sized petit-fours were served to the LGBT concertgoers, members of the orchestra, including David Fein, and Anthony McGill, the evening’s soloist. The New Jersey Symphony Orchestra should be congratulated for this community outreach. The evening began with a 7pm “Classical Conversation” with the composer Richard Danielpour, clarinet soloist Anthony McGill, and a moderator. Mr. Danielpour spoke of his composition to be presented that evening, a clarinet concerto titled, “From the Mountaintop,” a co-commissioned piece by Orchestra 2001 (Philadelphia), the Kansas City Symphony Orchestra and the NJSO, honoring the Reverend Martin Luther King, Jr. The composer stated that this piece was created to honor the Reverend’s “Mountaintop Speech,” delivered the day before his assassination. Completed in September 2013, these are the first NJSO performances. 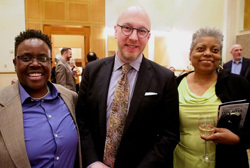 Mr. McGill, who is the principal clarinet of the Metropolitan Opera for the last decade, also spoke of his association with the piece and his relationship to it. The presentation ended with questions from the audience. The concert began at 8pm with Beethoven’s Leonore Overture No. 3, Op. 72, one of the overtures Beethoven wrote for his opera, Fidelio. It was a stirring performance. Jacques Lacombe, the NJSO’s music director, was the evening’s conductor. He chose to speak to the audience about the clarinet concerto which was next on the program. Interestingly, the maestro stated this concert was “all about freedom,” From the overture to the concerto to the symphony. He introduced Mr. McGill to enthusiastic applause. The clarinet concerto was an exciting piece written with inexhaustible invention to showcase a bravura soloist. Mr. McGill met every technical challenge superbly. The audience reacted to the piece with much applause and many in the audience stood for their ovation. The composer joined the soloist onstage for several bows. After the intermission, the piece to conclude the evening was Brahms’ Symphony No. 1 in C Minor, Op. 68. All too often, the Brahms symphonies can seem like masses of pointless music, but not here. The audience experienced one of the finest performances of this work to be heard anywhere. Led by Eric Wyrick, the superb concertmaster, the orchestra played as if possessed by the mind of Maestro Lacombe. Pointed playing, excellent rhythmic structure, and a sense of the inevitable marked this magnificent work which Brahms took many years to complete. When the thrilling performance’s last notes were done, the audience was inexhaustible in its appreciation.